Product prices and availability are accurate as of 2019-04-19 05:02:14 UTC and are subject to change. Any price and availability information displayed on http://www.amazon.com/ at the time of purchase will apply to the purchase of this product. 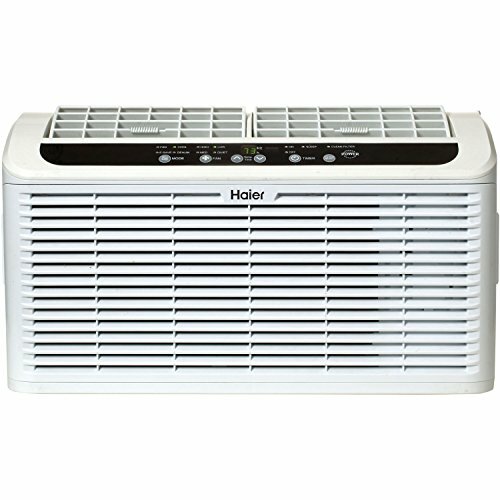 The Haier Serenity Series 8000 BTU 115V Window Air Conditioner features a compressor blanket for reduced noise resulting in ultra quiet operation at only 46 decibels. This unit also features a cross flow fan for stronger, smoother airflow and dual motor design for greater air control. Perfect for cooling a room up to 350 square feet, additional must-have features include a full-function remote, energy save mode, dehumidify mode, sleep mode, auto cool and a 24-hour on/off timer.